52 / the tasting panel / december 2015 S ommeliers taste tons of wine, as well they should, and also take the cake when it comes to consump- tion of wine literature. But, as the old saying goes, you are what you eat. So what's on your shelf, or among your bookmarked pages? After 37 years as a full-time wine professional—28 of those years as a sommelier or in restaurant wine management—I have to say that I could have done just fine with only five books: • Hugh Johnson's The World Atlas of Wine (now in its seventh edition, co-written with Jancis Robinson) • Jancis Robinson's The Oxford Companion to Wine (fourth edition just published) • Richard Smart and Mike Robinson's Sunlight Into Wine: A Handbook on Wine Grape Canopy Management • Michael Broadbent's Wine Tasting (Mitchell Beazley Wine Guides) • Kermit Lynch's Adventures on the Wine Route: A Wine Buyer's Tour of France I own about another three-dozen wine books. It rankles me that I rarely touch them. But fact of the matter is, beyond the aforementioned basics, a wine professional could always find all the information needed in periodi- cals—even before there was such a thing as the World Wide Web. That said, while meaning no disrespect, I can't think of a single thing that I've ever learned from reading com- mercial magazines. 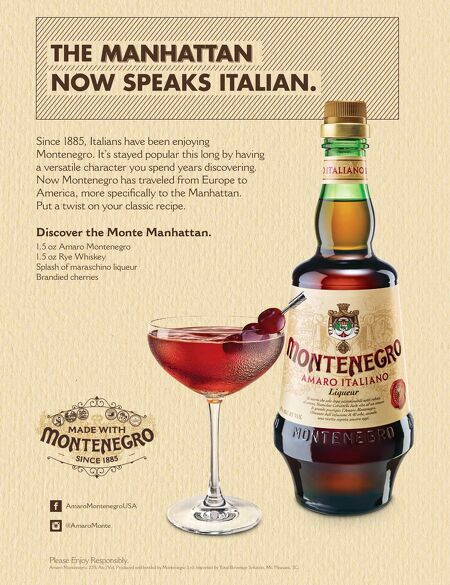 An on-premise wine manager can always find more useful information in trade magazines or simply by going online. Besides, since no one knows your food, your clientele and market better than you, you are far better off tasting and evaluating wines for yourself. The more you cultivate your own sensory skills, the better you get at your job. What are the most useful trade magazines? For wine professionals, first and foremost in my mind is Practical Winery & Vineyard—which recently (in 2013) merged with Wines & Vines—followed by Vineyard & Winery Management. There is just no substitute for understand- ing why wines taste the way they do, and to achieve that proficiency, you need to continuously build on your knowledge from the perspective of today's wine growing and production industry. In respect to restaurant industry periodicals, Ronn Wiegand MW, MS's Restaurant Wine has remained the on-premise industry's most consistent source of informa- tion for well over 20 years. And of course, for material composed by multiple wine professionals, The SOMM Journal and its sister publication THE TASTING PANEL Magazine will always be geared specifically to the trade. Then again, you already knew about the latter. Thanks for the follow, and enjoy your holiday sales season! 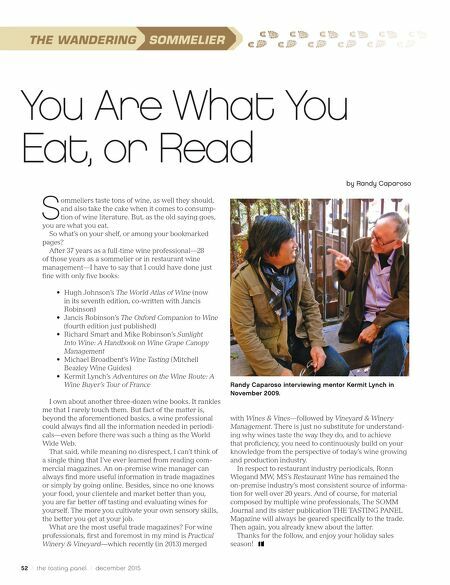 You Are What You Eat, or Read by Randy Caparoso Randy Caparoso interviewing mentor Kermit Lynch in November 2009.